a decline in the net number of immigrants arriving to seek work, particularly from New Zealand. …there has also been a large decline in net immigration from New Zealand. Labour market conditions in New Zealand tightened at the same time that spare capacity in the Australian labour market increased. The reconstruction activity in Christchurch took off around the time that construction in Australia’s resource sector was winding down. Indeed, the key mining states of Queensland and Western Australia have seen the largest declines in net immigration. Some issues I would have liked the Assistant Governor to discuss were trends in average hours worked and the composition of employment growth, which are of course related issues. 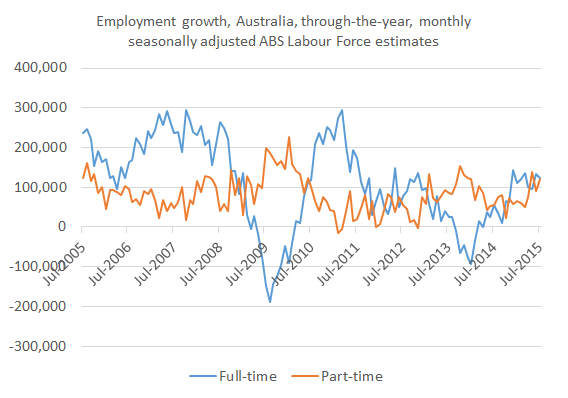 What we have seen recently is a relatively high proportion of new jobs being part-time jobs (see chart below). This may help reconcile sub-trend GDP growth with an unemployment rate that has not worsened. This entry was posted in Labour market and tagged abs, australia, employment, esaqld, gdp, jobs, labourmarket, nz, qld, queensland, rba. Bookmark the permalink.